Late last week the UK’s Minister for Arts, Heritage and Tourism, Michael Ellis, announced a temporary export ban on a study table once owned by Charles Dickens. 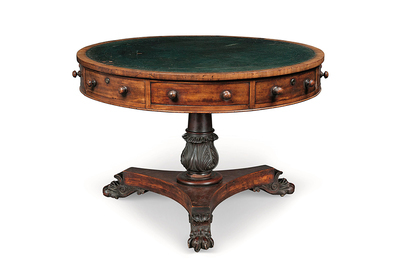 The round mahogany table with a revolving drum top covered in green leather was made around 1835 and was used by the famous author for most of his career, according to the Minister’s office, “first in his London home at Devonshire Terrace; then his offices on Wellington Street where he published Household Words and All the Year Round; and finally in his library at Gad’s Hill Place in Higham, Kent.” It remained in the possession of Sir Henry Fielding Dickens’ descendants until its recent sale at Christie’s London for £65,000 ($87,000). Presumably the winning bidder wished to ‘take it home,’ as it were, prompting Ellis to issue the export ban. The pending sale of Dickens’ table also calls to mind several writers’ desks that have gone to auction in recent years--one of which was owned by Dickens and was “saved for the nation” with a grant from the National Heritage Memorial Fund. Late last week the UK's Minister for Arts, Heritage and Tourism, Michael Ellis, announced a temporary export ban on a study table once owned by Charles Dickens. The round mahogany table with a revolving drum top covered in green leather was made around 1835 and was used by the famous author for most of his career, according to the Minister's office, "first in his London home at Devonshire Terrace; then his offices on Wellington Street where he published Household Words and All the Year Round; and finally in his library at Gad's Hill Place in Higham, Kent." It remained in the possession of Sir Henry Fielding Dickens' descendants until its recent sale at Christie's London for £65,000 ($87,000). Presumably the winning bidder wished to 'take it home,' as it were, prompting Ellis to issue the export ban. Ellis commented in a press release, "As one of Britain's most famous novelists, it is only right for there to be great expectations on us to protect Dickens' study table for the benefit of the nation." The pending sale of Dickens' table also calls to mind several writers' desks that have gone to auction in recent years--one of which was owned by Dickens and was "saved for the nation" with a grant from the National Heritage Memorial Fund.